As an experiment, and my idea of fun, I decide to re-set an old Novello classic from the end of the 19th century in Finale, matching the pages and system breaks. Trying to match a layout is much harder than just letting things fall where they may and seeing how many pages you've got. The Novello score was a real squeeze vertically, though Finale often wanted to put more measures on a line. Crazy to think that the original was 24.8 x 17.2cm (9¾ x 6¾ inches): I've scaled it to A4. I suspect there's heaps more fine tuning that could be done - particularly horizontal adjustment of notes in the voices of the organ part. Anyway, I thought I'd put it here to see if anyone has any comments or suggestions. There's also a double choir section, with two systems per page! My first impression, looking at my tablet, that emboldening of all lines would help in getting more overall balance. Also the hairpins for me should have the same line-width as staff lines. The slurs remind me of Sibelius default (endings are more curved than needed, personally I prefer more flat). In general: a very nice work and detailed outlook, publishing ready. How would I change the slur settings in Finale to be less curved? Printed out, I like the balance of the lines: I think if the lines are too heavy, the notes get lost. The staff lines are 0.625 pt; the hairpins 0.5. The barlines are heavier at 0.875 pt, but the differences are tiny. I'll try heavier hairpins. It's funny how the Finale version looks so much more widely spaced as the original. But actually it's not only because of the tight vertical spacing in the original; the width/height ratio of the printed area is also different. Which may make it not such a good idea to try to imitate the original layout, unless you copy the original page ratio as well. Yes, always more proof-reading. I noticed the first one as I put up the post. Having more room to play with on the X axis is quite useful, particularly for adjusting voice parts within the organ texture. I'll print out sample pages with different line thicknesses and see which I prefer. I've done similar experiments in the past and either found that the difference between 0.875pt and 0.625pt is all but indistinguishable; or that I find the thicker line too heavy. Perhaps I was over-exposed to thin lines in my youth? Haha, this is my quote of the day. Do you have access to a large group of students or choir members? That would be the best way to experiment with your settings. I did it once in a classroom, very interesting responses I got. Isn't using thin staff lines a rather recent trend in (computer) engraving? Maybe you're much younger than what I thought? Try changing the Inset Percentage. FWIW, the very first sentence about Hairpins in Gould (pg 103) is "Hairpins are the thickness of a stave-line." Personally, I actually use the thickness of a ledger line. I find the hairpins look better that way when there actually are ledger lines (as opposed to being thinner than they are) and the slight added thickness helps to prevent any possible disorientation to the sightreader if the hairpin is a space or so below the staff. I assume this will not be a popular opinion though. The problem I have with the above is that in practice very thin lines can almost disappear when being read by aging eyes and orchestra lighting. Years back I was experimenting with thinner staff lines and I had several musicians request parts with thicker lines so I changed my house style. Now that I'm close to needing bifocals myself, I can definitely see the advantage. Nothing crazy thick, but definitely thicker than the Finale default of 1.8 EVPUs. Also, you are using two fonts, Bodoni and Kepler, that are too similar to be combined on the same page IMO. As both are "modern" fonts, meaning strong contrast between thick and thin, they really are a poor match for each other. I love Kepler (and most of Robert Slimbach's fonts) as it's sort of a humanistic modern, but I just wouldn't ever pair it with Bodoni. Yes, but to what? Finale's defaults are between 30% (for a short slur) and 20% (for a long one). I thought I was making slurs flatter by reducing that figure significantly and limiting the height. Can you post a document with your dream Finale slurs? As for the fonts: Kepler (Semicondensed Caption) is my ideal lyric font after going through pretty much the entire Linotype catalogue, as I've mentioned elsewhere in this forum. It seems to offer the best spacing and legibility. Bodoni has been my house font for titling for years: as an 18th-century Modern face, it's quite similar to musical symbols such as dynamics letters and the time sig numerals. I don't (or didn't until now) see Kepler as that similar - it's much more of a Transitional face. Certainly some sort of hybrid, as you say. Modern faces don't work well for lyrics at all, but Kepler does. I'm not sure I've got the will to go through all 160 of Kepler's fonts to find ones to entirely replace all my titling and expressions. Doesn't Dorico use LibreBodoni for titling with Academico (a free Century Schoolbook) for lyrics? I'm sure I've seen a variety of modern face in some publishing houses' scores. Apropos of nothing, I note the OUP are using Plantin for lyrics and Sabon for titling, and I'm not sure of the merit of that. I agree somewhat with Edward Tufte on staff lines - I've always seen them as "graph paper" lines, a background reference against which the more important symbols are placed. I guess the question is: how thin a line could traditional engravers achieve on press? I myself have just been prescribed glasses. It's actually made the music much clearer! 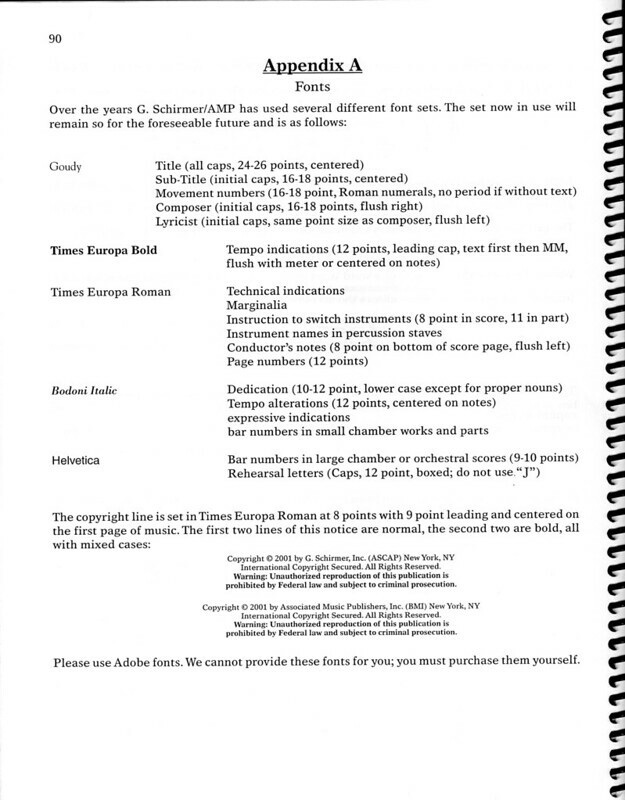 "The base font used in Boosey scores is New Century Schoolbook. In its roman, italic, bold and bold italic forms this provides the basis for almost all text used in a musical context." 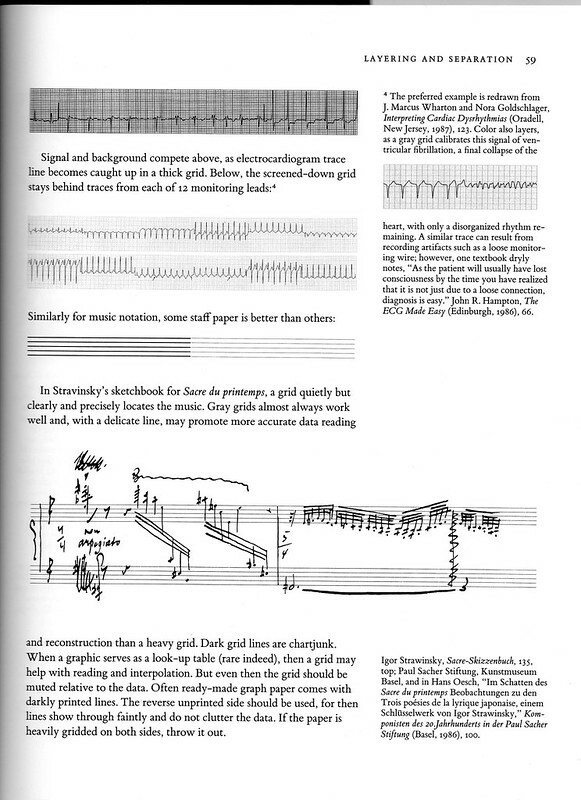 (pg 95 in their style guide) Boosey uses New Century Schoolbook as a serif font, Helvetica for sans, and Gill Sans for the tan and green Hawkes Pocket Scores.